Earn Points. Get Beautiful Art. Or A B&B Stay. Introducing the Louisiana Ink Art Loyalty Program*. 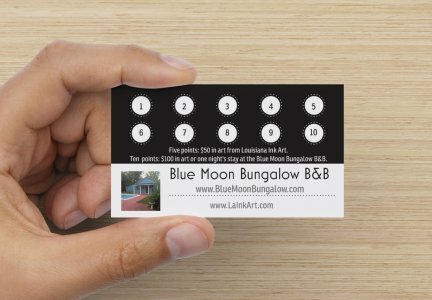 Earn points toward free or discounted originals, prints, matted and framed pieces, as well as an overnight stay at Martin's guest house, The Blue Moon Bungalow Bed & Breakfast in Bunkie. 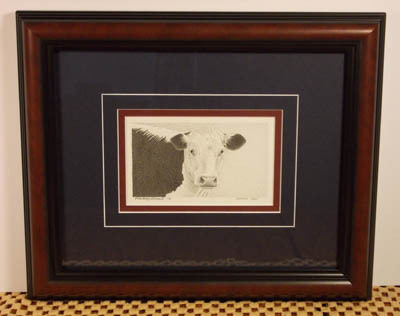 Loyalty Program Members are awarded a point for each $45 of regularly-priced art purchased from Martin at a show, online, or at the Winsum Centennial Cottage studio. 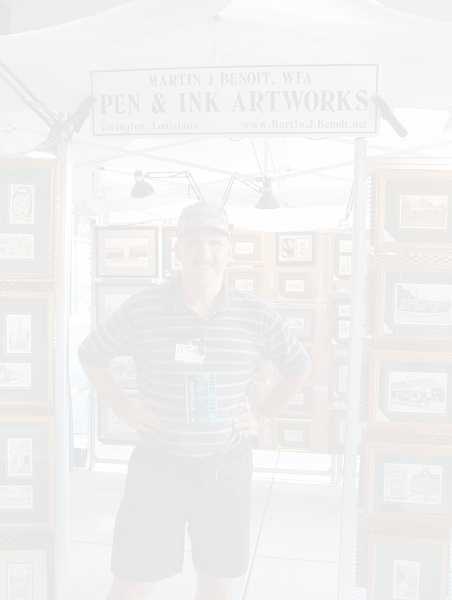 With as little as 5 points, get a $50 credit toward any original, print, matted, framed or commissioned piece by Martin. Or collect 10 points and choose either a $100 credit toward Martin's art or an invitation for a night's stay at his quaint bed & breakfast, the Blue Moon Bungalow B&B. The Blue Moon Bungalow Bed & Breakfast is Martin's furnished guest house on the grounds of Winsum Centennial Cottage, his home studio in Bunkie, LA. 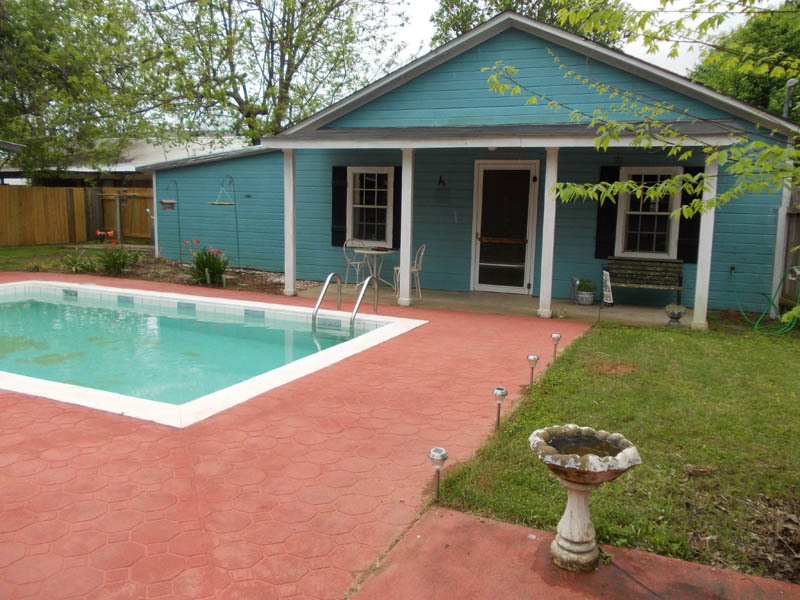 Close to places and activities in and around central and south Louisiana, this secluded retreat features a queen-size bed, a full-sized futon, a 32" TV with DVD, wi-fi connection, a large kitchen area, convenient dressing room, and bath with shower. Outside the front door is a relaxing, 7,000 gallon swimming pool and a covered patio to spend your time after a day's exploration. Signing up is quick and easy. Once you do, we'll send you a Loyalty Card to keep track of your points. We'll track your points, too, and let you know when you become eligible for rewards. * We value your privacy and do not share your information. Limit one Loyalty Card per member per address. Additional Loyalty Card may be requested upon completion of first card. Points awarded for regularly-priced items from Martin J Benoit or through "Loyalty Program Only Specials". Points not awarded to or redeemable for sale items. Purchase amounts between point minimums not carried over. Required point purchase minimum may change at any time. Loyalty Program may be discontinued at any time with members receiving pro-rated point credit up to time of discontinuation. Images and information throughout under the exclusive copyright of Martin J Benoit, WFA and may not be used, transmitted, or reproduced in any form without express written authorization.